This is Part 9 of our New York Food Adventures! Check out the rest here! Wendy: AngryRussian continues his review of New York Pizza! The next two places we tried were of the more traditional “slice” experience whereby the pies are already cooked and served from behind a counter- Majestic Pizza and Calzone, and Rose’s Pizza and Pasta. 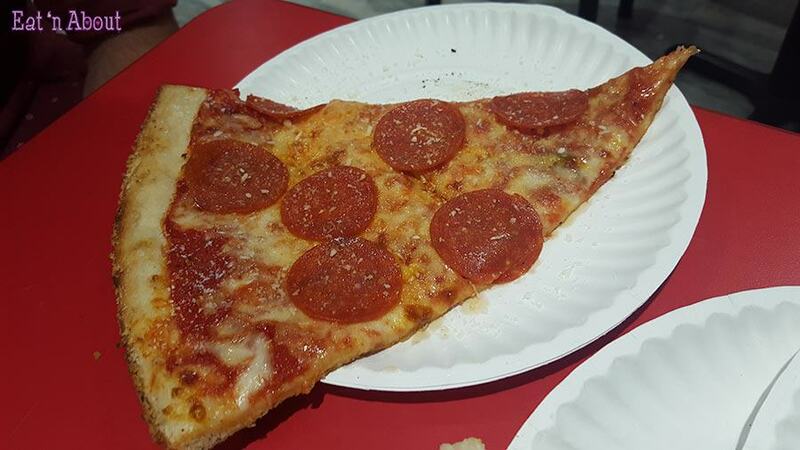 Majestic Pizza and Calzone is near the World Trade Center Memorial site, which we had just visited, and had a decent review from One Bite (7.1) so I thought I’d grab a slice. The place was pretty busy and they must’ve had about 8-10 pies out on display to choose from. I once again went with the Margherita ($3) which they briefly reheated in the pizza oven for me. 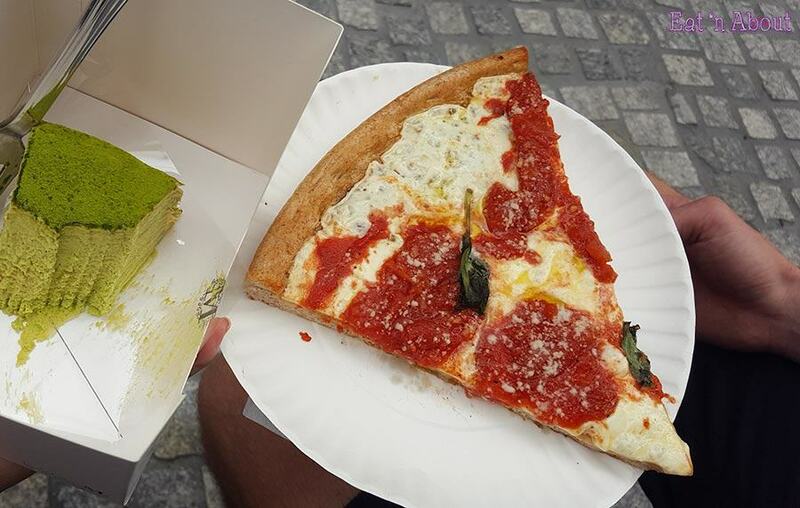 The highlights of this slice were the sauce and cheese which were fresh and delicious (and once again it could’ve used a couple more basil leaves). The crust on the other hand brought the overall slice down to more of an average level; I think I had inadvertently gotten a whole-wheat slice! :O It was harder and more dense than usual and had almost a pre-baked aura about it. All in all I still enjoyed the pizza but I would have liked to have known that I was getting whole-wheat because I think a regular crusted slice here would’ve been excellent. The other slice joint we visited was buried in the depths of Penn Station (one of Manhattan’s busiest train and subway stations). Because it was: a) underground beside Madison Square Garden and b) in Penn Station which encompasses several blocks and has many entrances and levels, Rose’s Pizza and Pasta was difficult to find. Even the friendly NYPD officer we asked sent us into the wrong part of the station complex. So after wandering around for a good 15 minutes we exited, crossed the street, walked a block and tried another entrance. We finally found a directory, descended two levels and saw Rose’s, shining bright and smelling delicious (if you can separate its aroma from the subway filth and urine odours). 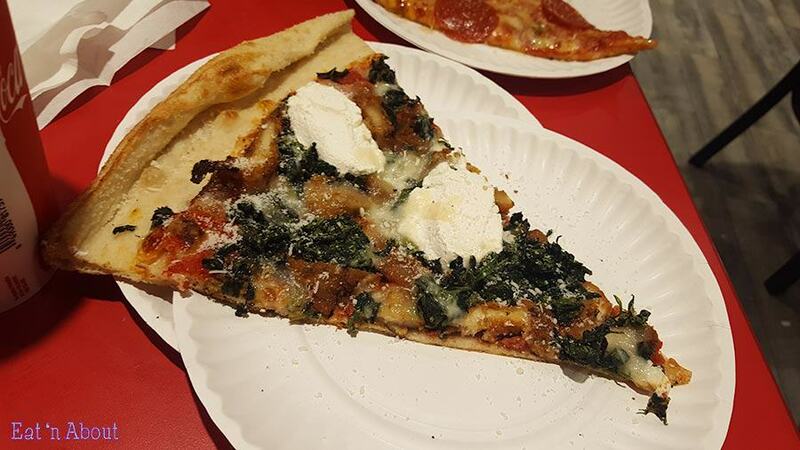 Rose’s (score of 8.1 on the One Bite pizza app!) 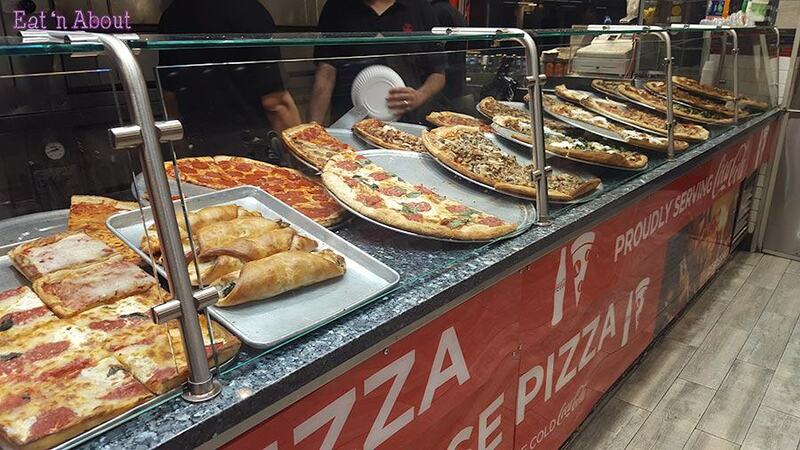 is a large counter-style slice store with a large beer and wine tap selection and lots of seating which is apparently popular with commuters and pre-event Madison Square Garden patrons. I got a slice of Pepperoni and Wendy picked a Chicken, Kale and Ricotta concoction out of the approximately 16 different kinds they had to choose from ($3.5-$4/slice). I enjoyed mine, it was typical of a classic pepperoni slice, and it has nice cornmeal dusting on the outer crust and underneath. Wendy’s had a few dollops of ricotta amongst the kale and breaded chicken chunks. I tried it and it was okay, but like a lot of chicken pizzas the meat was a bit dry from sitting around under the hot lamps. On our way out I grabbed a slice of Margherita for the train ride home (but forgot to take a picture), it was decent but nothing amazing. 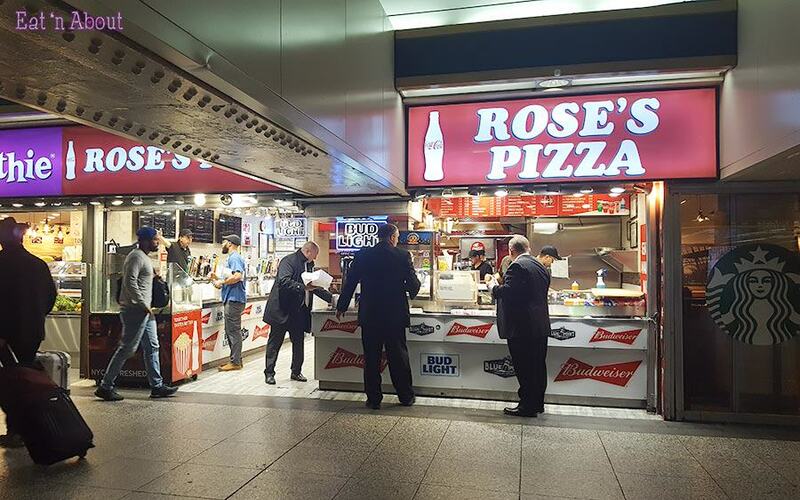 I can definitely see the appeal of Rose’s though: great choice of pies, decent prices, big beer selection, and proximity to Madison Square Garden and several subway and express train platforms. Thanks for reading! Stayed tuned for the last part of my New York Pie review!